It is fascinating why cockroaches are so capable of traversing beam obstacles with gaps even narrower than half their body width, while the robot is so miserable in becoming consistently stuck between obstacles with gaps even wider than its body (see biology and robotics observations). Notably, an obvious difference between the two is body shape (Fig. 1, left). The discoid cockroach has a well-rounded body, resembling a thin slice of an ellipsoid. By contrast, the robot body is much more angular, with many corners, edges, and flat faces. Figure 1. Terradynamic streamlining hypothesis. When animals and robots go through densely cluttered terrain (gap size ~ or < robot width) such as grass-like beams, their body often physically contact with the surrounding environment. This is much like birds and fishes having to push against the surrounding fluids to locomotor through air and water. Inspired by streamlined body shapes that reduce drag and enhance movement in fluids (Fig. 1, right), we hypothesized that the rounded body like the cockroach’s can enhance movement in densely cluttered terrain by reducing terrain resistance; in other words, such rounded body is terradynamically streamlined. 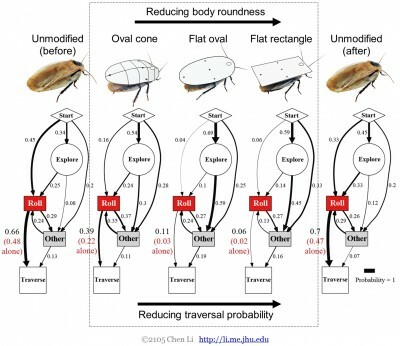 To test this hypothesis, we used artificial shells to modify cockroach’s body shape, and observed how their obstacle traversal are affected (Fig. 2), while controlling for shell-induced changes in volume, mass, and friction (Fig. 2, left) and eliminating the effects of long term learning and fatigue (Fig. 2, right). We discovered that, as body roundness is reduced (Fig. 2, middle), traversal of beams using the most effective roll maneuvers is nearly inhibited, while other less effective locomotor modes (represented together by gray boxes) occurred more frequently. This demonstrates that body roundness indeed results in more probable and faster traversal, confirming our terradynamic streamlining hypothesis. Figure 2. 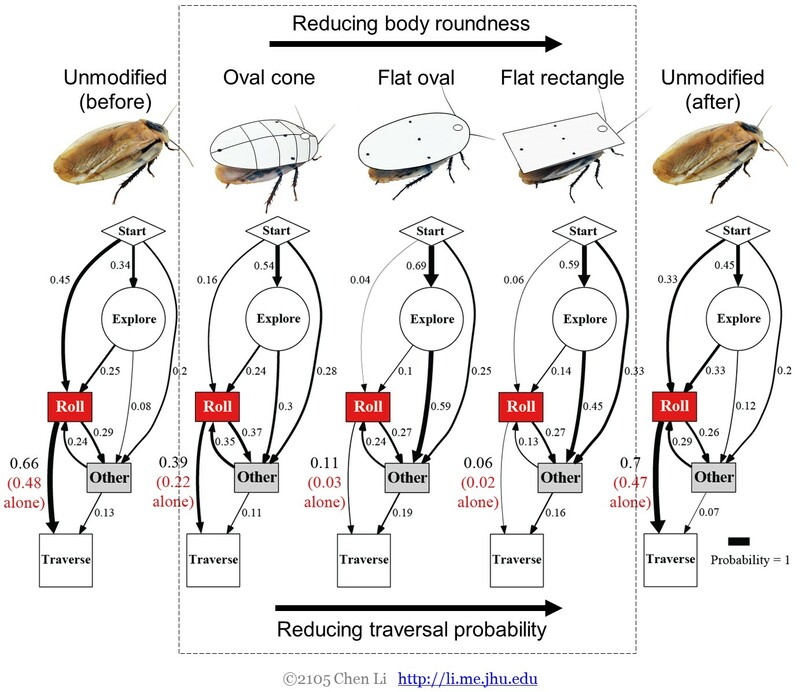 Shape modification experiments show that body roundness enhances cockroach’s beam obstacle traversal, primarily by facilitating roll maneuvers. 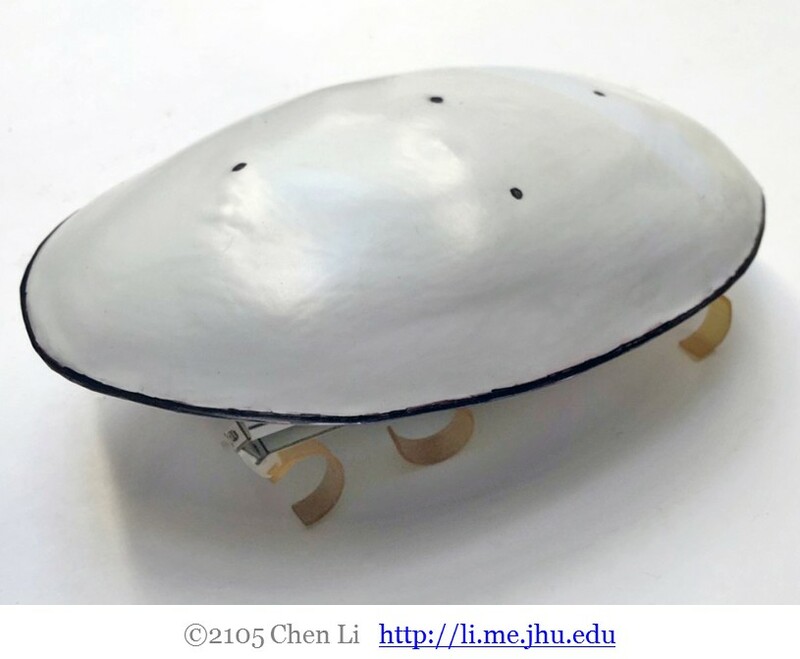 Inspired by our biological discovery, we added a rounded exoskeletal shell to our legged robot and tested if terradynamic streamlining also works for robots. Figure 3. The legged robot with a cockroach-inspired, terradynamically streamlined, exoskeletal shell. Without having to add any sensors or changing the open-loop motor control program, this simply shape modification enabled the robot to traverse beam obstacles using roll maneuvers. This is particularly remarkable because now, with the shell, the robot body width is actually wider than obstacles! Here our robot can for the first time traverse, rather than go around, densely cluttered obstacles (obstacle gap < robot width), purely through mechanical interactions. This complements the traditional mapping and path planning approach in robotic obstacle negotiation, which often fails when obstacles become densely cluttered.